I'm continuing to put a dent in my 2014 Studio Calico scrapbook kits so you'll see a lot of that older product mixed with some of Ali Edwards Story Kits and Kelly Purkey stamps. 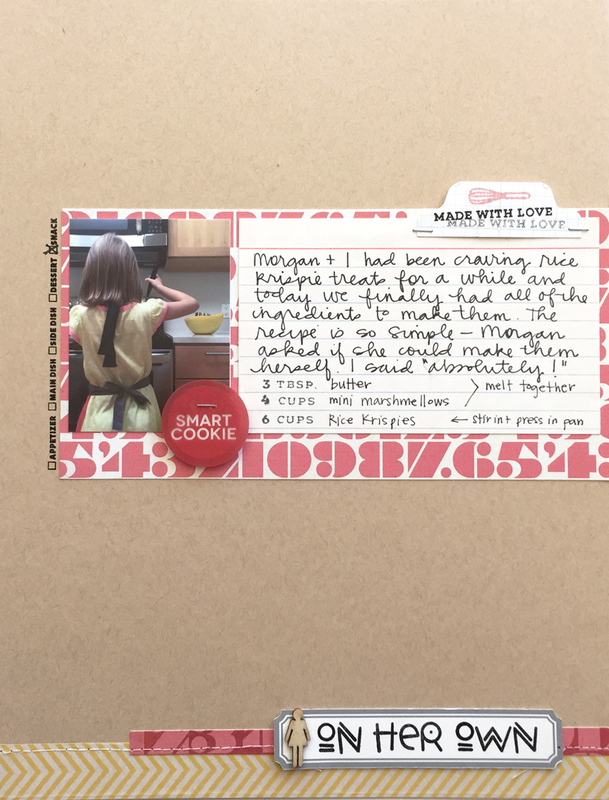 On her own // When I saw Kelly Purkey's new Made With Love stamp set, I knew I wanted to start with a simple index card for the journaling as a little tribute to this old-school way of storing recipes. I printed a small photo of Morgan making rice krispie treats on her own last summer and layered them on some old Basic Grey patterned paper. I punched a tab for the top edge of the index card and stamped 'made with love' along with that cute little whisk. The title was stamped with Kelly's Henry set (now sold out) on a gray label and layered on the bottom edge with some washi and a patterned paper scrap. From the library of Parker // My little guy has really developed an interest in books and reading in the last year so I chose some photos of him from this past summer - reading on his own and with Morgan - for this layout. I trimmed down my papers (from the Studio Calico Brighton Pier paper pad) to the same size as the photos and arranged them with the photos on the left, paper on the right, then added pop dots under the smaller pieces for a little extra lift. I added stamping details throughout with Kelly Purkey's Bookworm set. Coast Bound // While I don't love the plastic alphas from the Hello Hello kit, I was determined to use them. I found this aqua cardstock in the kit and it was a perfect match with the letters - giving a great tone-on-tone effect. I played around with some title options and decided on 'coast bound', as it was also 6" wide, just like my photo. I love when things line up like that. I adhered the photo and stitched down the letters, being careful to hand crack through the centers of the O's so I could trim the thread out and stamp in middle. I used the perfect road trip icons from the Clearly Kelly Travel Day set to accent my title and the tiny tag that I clipped to the edge of the photo. Since my layout was off-center, I layered and stitched some beach-y wood patterned paper and a transparency to the left edge. hello // I love a simple repeating journaling prompt, so that's how I chose to use the foam 'hello' stamp in the Hello Hello kit. After arranging and adhering my photos, I began at the top and stamped 'hello', then handwrote my journaling, repeating all the way down the right side of the photos. While I really love the photos here, I dig how the dark woodgrain paper (which reminds me of the dock) and the bright striped paper pop in this layout. Happy Camper // This two-page layout is 6x12 (in green) on the left and 12x12 (in kraft) on the right. I had plans to document our summer camping trip in a mini book but talked myself out of it and went with a larger layout instead. My favorite way to get a lot of photos in a layout is with a grid, so I printed several 2x2 photos and circle punched them along with some patterned paper. I arranged the wood pieces to form a visual triangle between the two pages, then moved the photos and paper around until it felt balanced. I saved all of my journaling for the narrow side and cut up the patterned paper full of words to accent the photos and create a title. & // This little oddball layout is 6x12 for no reason other than I had a scrap of this faux chalkboard paper and a small 3x4 photo to use. I stamped the ampersand from the Hello Hello kit with white paint to create a background and layered my photo and some patterned paper strips over it. I stuck with the aqua as my sole color in this layout and found these puffy alpha stickers in my stash to label my and my sister's first initial. The chipboard banner is from Ali's Gatherings Story Kit. Slow Down // I took this series of photos of the waves coming in on Rockaway Beach in Oregon but, silly me, my finger was in front of the camera in the lower right corner the entire time. Ugh. I decided to try to use them anyway and cover my mistakes a bit with some embellishments (from Penny Arcade) and typed journaling strips. I went with a dark cardstock background to match the dark sand, with pops of color in yet another layered and stitched edge. I didn't realize I did that so much this month until I photographed everything yesterday! Hello new beginning // After I got Ali's Firsts Story Kit, I purposely saved the pieces in this layout for one about Parker's first day of kindergarten. That wide washi from an old Studio Calico kit was perfect for my journaling - which I tried hard to print rather than write in cursive to make it more legible and school-like. This is one of the simpler layouts this month, which is good, but when I was finished I felt like it was missing something, so I trimmed 1/4" off all of the edges and backed the entire thing with a piece of notebook patterned paper from Sandlot. Two months to go and I go back and forth between feeling confident I can finish strong, and thinking 'yikes, 50 was too much.' No matter what - I'm so happy with what I've made this year. In 2015, I want to use my stash and tell more stories, so I've set a goal to create 50 layouts. 36 down, 14 to go. You can see them all here.